Over at the We Are Teachers blog you'll find a nice set of suggestions for combating "summer slump," that period of time in which children's brain revert to primordial ooze due to lack of use. Equally cool and instantly available to all at this site are some suggestions from LeapFrog Literacy Expert Carolyn Jaynes, PhD., who shares her tips on how to get kids hooked into reading over the summer. Book Clubs - Boys and girls alike love the idea of getting together with their friends, and choosing a common book to read and discuss together creates a fantastic experience. The mother who shared this idea explained that both the moms and their boys read a couple chapters of the book together ahead of time, and would attend the club together. There'd be a time of discussion, perhaps an activity or trivia quiz, and then food. Afterwards, the boys would play while the moms chatted. The boys in this group got through three novels in a summer! For boys, sure-fire hits include sports novels such as Mike Lupica's Summer Ball , and survivalist science fiction such as Suzanne Collins' Hunger Games (as well as sequels Catching Fire and Mockingjay ). Picture Books - Some kids won't slog through a novel during the summer, but love a pile of high-interest, vocabulary-rich picture books about a favorite topic, be it magic, motorcycles, seals, soldiers, fashion, or food. Picture books are just more inviting for a browse or a quick read. Nonfiction books, especially, with their text boxes, captions, and nonsequential format, make for quick reads. Bedtime Books - A third mom "tricked" her daughter into reading by putting her "in charge" of read-alouds at night for a younger sibling. The elder daughter earned a later bedtime provided the stories took place nightly. Trips to the library and lots of reading aloud, explaining, and discussing kept the daughter's mind sharp all summer. The experience also helped the younger daughter appreciate literature as well, and made a memory that can't be surpassed! 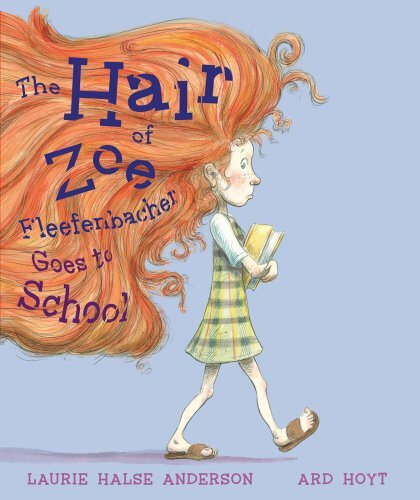 (A book like Laurie Halse Anderson's The Hair of Zoe Fleefenbacher Goes to School is not only a colorful and silly read, but it helps alleviate those back-to-school-anxieties which sometimes come creeping in late August). What are your ideas for keeping kids reading during the summer? I would like to add library summer reading programs to your list of ideas for keeping kids reading. Nearly every public library has a summer reading program. These programs offer incentives, shows, craft programs, and other events to get kids into the libraries where there are lots of... BOOKS!